I wish I wasn't writing this post. And you should wish you weren't reading it. Because all of these fudge recipes are delicious and easy to make. And totally unhealthy. So let's pretend all this fudge is not for you, it's for the next time you have to bring something last minute to a neighborhood party, and need something really easy to make. 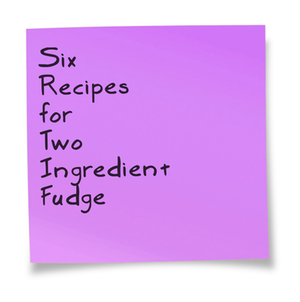 Oh and did I mention all of these fudge recipes are made with just two ingredients? I just read that Nutella can be substituted for chocolate chips, so looks like I'm making two ingredient Nutella fudge, I'll let you know how it turns out! Do you have a favorite two ingredient recipe? Let me know in the comments!